On Android, Google Now serves as the virtual assistant Siri is on iOS and Cortana is on Windows Phone. Thus, Google Now can take voice commands and act on them. But up until recently that did not include toggling certain system settings – not directly, at least. 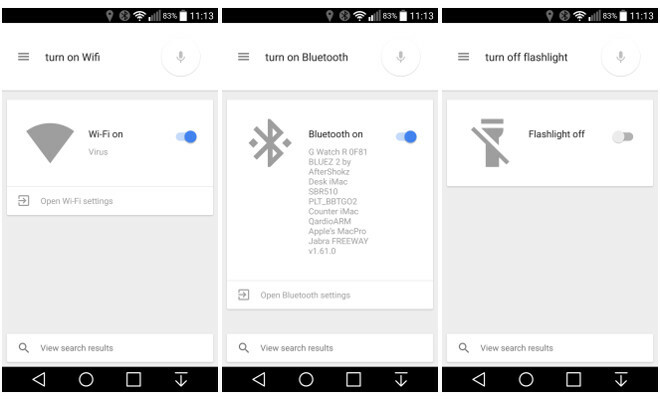 The good news is that as of this moment Google Now is in fact able to toggle your Wi-Fi and Bluetooth connections on or off, as well as the flashlight functionality enabled by your phone’s LED flash. The one caveat is that you need to be running Android 5.0 Lollipop. Before, if you told Google Now to “turn Wi-Fi off” for example, it would simply take you to the relevant menu inside Settings (and this is still what happens if you use Google Now on older versions of the OS). That was reasonably helpful, but the new functionality is much more so. Now when you tell it to turn Wi-Fi on or off, it simply does that. And the situation is identical for Bluetooth and the flashlight. Interestingly, the flashlight toggling works even on devices that have had the corresponding functionality removed from the Quick Settings by their manufacturer. The LG G3 fits this description, for example. This creates an odd situation where for such handsets the only way to trigger the flashlight function built into Android 5.0 Lollipop is by voice. Once you’ve told Google Now what to do, you get audio feedback letting you know that the action has been performed, as well as a card and a small toggle (as you can see from the screenshots above). The toggle that’s displayed helps you quickly revert an action if you made a mistake. For now just these three commands work like this. Trying to directly toggle Airplane mode, Location, Brightness, or Volume via voice results in you being taken to the appropriate Settings menus – just what used to happen for Wi-Fi, Bluetooth, and the flashlight too. So hopefully more direct voice toggles will be enabled in the future.